Upon arrival of this home you will fall in love with the large front porch that offers views of the park. 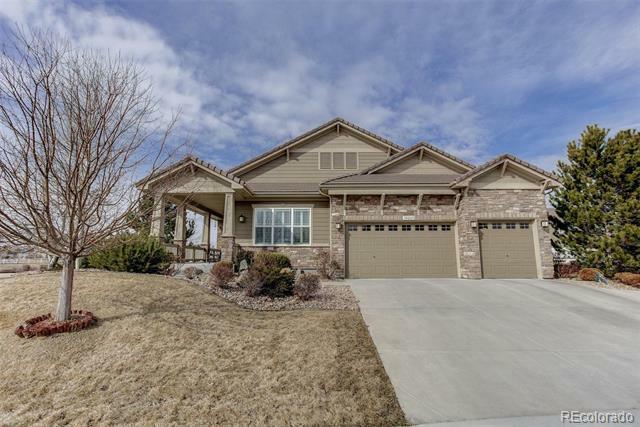 Step inside to the beautiful wood floors and open floor plan. Elegant chef's kitchen w/double ovens, gas cook top, new granite countertops and backsplash, all stainless appliances incld wine refrigerator, eat-in kitchen and formal dining rm. Formal living, study w/french doors and 2 additional spacious bdrms complete with a full shared bath w/double vanity. The generous master suite is the perfect retreat w/stunning custom stained glass, luxurious 5 piece bath w/fancy remote multi-function shower, towel warmer and more! Main flr laundry/mud room leads to the 3 car gar. Full unfinished bsmt is huge w/over 2800 sqft to use as storage or finish off as you desire...the possibilities are endless. Step outside to the large brick patio with new Pergola and built-in fire pit to enjoy our Colorado sunsets. New landscape along with an inground trampoline is just waiting for you to enjoy.